I’m afraid I’ve misled you already. This guide is actually going to spill over into Kardashian style exteriors as well as interiors – you would possibly think posteriors too being about the Kardashians, but you would be wrong. Last month Architectural Digest featured a home shoot with Khloe and Kourtney Kardashian and there are two spaces I want to share with you to give some inspiration. One was inside and one was outside. As we don’t have Californian weather I feel I am covering all necessary bases here. Please excuse me, but I have got quite excited by the ability to wear my coat without the zip done up the past couple of days, which in my book, as a Brit, is practically summer. The first is what looks like their lounge area. It’s probably one of several, but let’s just pretend it’s where they sit to watch Corrie. The 3 simple ways come later, but first some bits as an amuse-bouche. Now the mirror is obviously the main feature of the room, and a little too blingy for me anyway, but I’m going to do a blog on mirrors next week, so I’ll be covering how to make mirrors work for you then. The sofa – well you have got to be pretty serious about this if you’re willing to go that far. If you really love the Kardashians you could remove the feet to replicate theirs – but then remember they’re probably getting a new one next week…with feet…and now yours wobbles…and is no longer worth 4K. 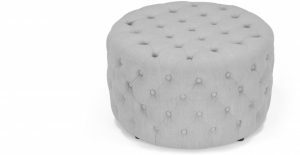 The pouf table or round ottoman is very cool and I have found this one that would do the trick. It’s from the Blakes collection and £119 from Made (they also do a larger version but that’s just shy of £300 and I’m going to assume that we don’t all live in mansions). 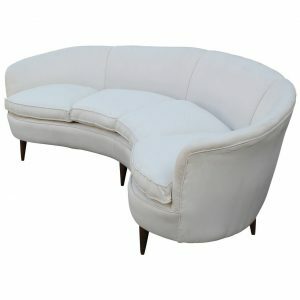 If you wanted to take it a step further you could add studs, but personally if I was going to do that I would just buy a much cheaper one and upholster it. There are, however, two features that more subtly give that room the edge and can easily and cheaply be done to your own lounge. 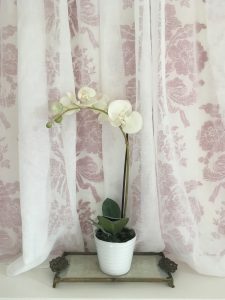 The first is a super simple effect to create and the perfect solution for a wall that has seen better days, or for softening an over-excitable feature wall. You will notice their curtains don’t stop with the window but continue around the wall. You could go the whole hog and create the tent effect on the ceiling as well, but for today let’s stick with the wall. The first thing to point out is that you don’t need to use expensive fabric here. Just a muslin, which you can get for about £5 per metre, will give you a great look. You will need some way of fastening this to the wall. I’ve experimented with this and I think the best solution is to take either thin offcuts of wood which you could pick up from your local builder’s merchants, or what I’m doing is using some moulding I had lying around. Sewing machine, or needle and cotton for those with time to kill! Measure the wall you want to cover. Multiply the width by two to work out how many widths of the muslin you need for the ruffled effect. To get the length of fabric needed, divide the width of the wall by the width that the fabric comes in, divide that by 2 and then multiply the height of the wall plus 25cm to allow for a hem and pooled effect at the bottom and for the fold at the top. It’s always safer to get 10% more than you need. Cut the fabric into the necessary drops and sew a hem at the bottom, allowing about 10cm of pooling. 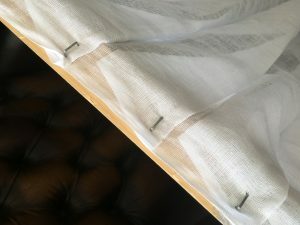 Take the length of timber or moulding (which depending on the thickness of the fabric you may need to paint first) and hold the fabric against it, folding it in on itself to create pleats, it makes sense to use glue as well as the staple gun (or drawing pins if you’re a pacifist). Once you have covered the necessary width you flip the fabric over to cover the timber, which is then screwed to the wall with the screws covered by the fabric. If the fabric needs ironing, iron it before you hang it rather than banking on the creases dropping out! If you have children or clumsy partners, it may be safer to use a wall behind a sofa. Not advisable if you have cats as they are likely to see this as a 3 peaks style challenge. I think this is a great way of softening a room and adding an interesting element. I wouldn’t personally do it all the way round, but just choose one wall instead. 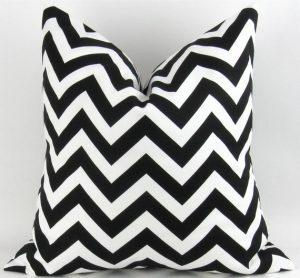 The second feature in the Kardashian lounge is the black, grey and white zigzag cushions. This is very in at the moment, and it immediately gives a sterile white room a touch of zing. 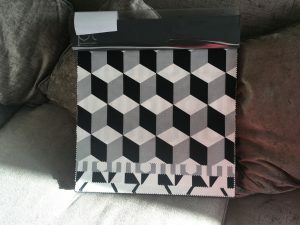 Now I’ve found these couple of cushions you could simply buy online to give you the look, but if you want something unique, cushions are one of the easiest things to make so I’ve found some gorgeous fabrics. This one is from Prestigious Textiles and the book is called Cube – the feature fabric on the front of this book is also a great one to match. These fabrics are £14 per metre. My piece of advice where cushions are concerned is to go large – even large enough to replace the back cushions of your sofa if necessary. 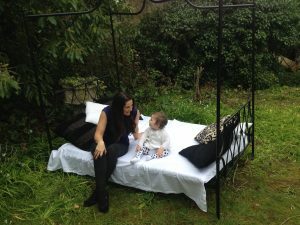 This I have got very excited by as I have been wanting to relive some of my holidays abroad by introducing a 4-poster bed to my garden. As you can see the Kardashians have black metal posts on theirs and have used a black and white theme. We always tend to use pastels outside, but I’m loving this look and think it’s more sophisticated. What I managed to find was a second-hand Laurence Llewelyn Bowen indoor 4-poster bed on Gumtree for £100, sorry Laurence….but you can still get it new for £369 – at Littlewoods. This will be easy for me to create a canopy with fabric because of the central part of the top to hold it in place and I also plan to grow climbers up the posts, perhaps even to create a natural canopy. I do need to make it weather-proof by painting the wooden slats with exterior primer and topcoat, and the metal with Hammerite. I’m using the thin mattress from a sofa bed, which will then fold up to easily store inside…when it inevitably rains 10 minutes after lying down. And we are back to cushions. Now remember these are not just for decoration but to sit against whilst reading a book on a Sunday afternoon, so again go really big. 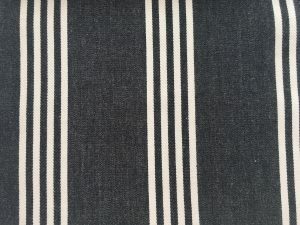 This style is easy to find online, but here is some gorgeous striped fabric you could use as well if you are happy to make your own. 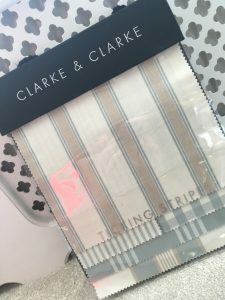 The book is called Ticking Stripes from Clarke & Clarke and the fabric is £19 per metre. In my picture they are a couple of cushions I quickly bought from a charity shop. Wall curtain to give a luxurious look, or soften a feature wall. 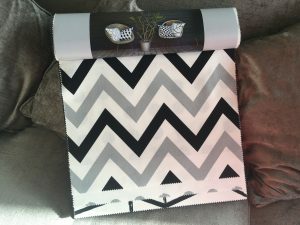 Large striking zig zag cushions to offset an otherwise bland room. Black and white theme for exterior lounge area. And there you have it, 3 simple ways to get Kardashian style interiors…and exteriors…plus some other bits. 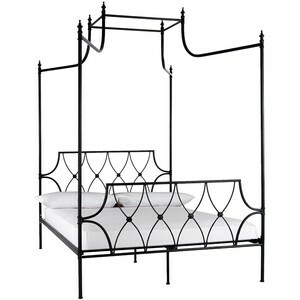 Wow, I love the four poster bed for outside idea, especially as it can be used for climbing plants to grow around! Great ideas…keep them coming Georgina! Thanks Jo – having garden done this week so I’m gutted I’ve not been able to make the most of the sunshine – guy doing the work seems confused by the 4 poster bed idea! Massive fan of the black and white stripe look! Lots of great ideas here and we look forward to mirror talk next week! Thank you – send me pics if you do any yourself! to find quality writing like yours nowadays. I seriously appreciate individuals like you!